At CoakleyKrol, LLC, we started our firm with the goal of providing personalized, cost-effective legal services to individuals, families and businesses in our local Colorado communities. When building our practice, we considered the myriad of ways contemporary law firms were failing to connect with clients and take advantage of burgeoning technologies. Instead of building a firm on the old model, we decided to create a new firm, from the ground up. 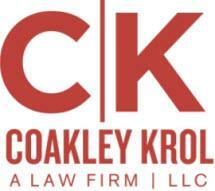 CoakleyKrol, LLC, was born with the concept of creating a firm culture centered on creativity, innovation, personalized service, and vigorous legal representation. Our attorneys focus on providing resolution-based legal services. We accomplish this by spending time with each client who comes through our doors. We take time to understand the circumstances that led to legal action, outline goals and objectives, and develop strategies that pursue those goals while remaining mindful of our client's budget. In addition to our primary practice areas, we handle criminal defense cases and other civil litigation matters. If you require representation or simply need to speak with an attorney regarding a pending legal matter, we encourage you to reach out to us and schedule a consultation at our Denver law office. Our team of attorneys is NOT your average assembly of downtown lawyers. Our practice is focused on results, not flash. Discover our difference and contact us today.